Kids love to use the same things that their parents are using. Rather than buying them toy versions of objects, we use these opportunities to teach them the correct way to use everyday objects. My son loves to see us use the computer, and wants to use a computer too. So we bought a real adult keyboard at an electronic store, and attached it to a real computer running Linux. The only thing he can do is hit a key and see the computer's reaction. In most programs, this produces no visible result. The child uses a "real" keyboard and a real computer, something that parents use too. There is no way to exit, except to Alt-Tab to switch programs. The child can be rough with the spare keyboard, you just buy a new one. 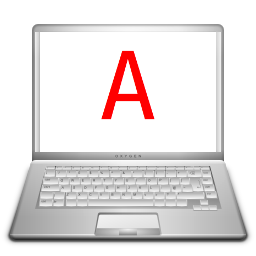 The computer can be disconnected from the Internet, and put on a spare child account if required. The program should work on Windows and Mac as well, after you set up Python + Gtk.
""" Create a Gtk window for a single giant textview that accepts all keyboard input. """ """ Create a window with a single giant text view. Disables all chrome. # Connect the callback on_key_press to the signal key_press. # Make the widget aware of the signal to catch. # Disable a cursor in the text view. # Create a bigchar window, and show it.